Searching and researching trouble codes is often the first and easiest step when it comes to diagnosing an issue with your Harley Davidson. We have already showed you how to pull up possible codes through your speedometer head; but then what? Often times further diagnostics and conclusions can be accomplished with just a test light and a multimeter used in conjunction with your factory service or electrical manuals. Other times, however, final conclusions can not be made without the use of some type of a Harley scan tool. Unfortunately, this involves either paying the dealership to test your bike with a Scanalizer or Digital Technician; or purchasing a costly aftermarket Harley scan tool for yourself. Although both avenues are costly, either choice is better than guessing and possibly purchasing parts that your motorcycle may not even need. We made this video just to give you an idea of what you may be paying for if you opt to have the dealership diagnose your motorcycle. Remember, it is always an option to have the dealership diagnose your motorcycle’s problem, but then take care of the repair yourself. Paying for one hour of shop labor is much better than possibly ordering a part that you did not need. You can avoid wasting money and, possibly, have less down time. 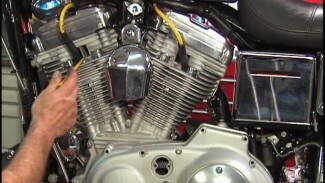 Here, Bob gives us a short Harley scan tool demo with Harley’s Scanalizer. This tool is capable of much more than finding and clearing codes. It can also be used to monitor live/active running running conditions/data. In most cases the technician will be able to pinpoint the failure even in cases where a problem was intermittent. It is typically not feasible for the average wrench to afford every specialty tool needed for motorcycle’s repairs. A quality Harley scan tool is over $1,000 and certainly no exception. If you can not pinpoint an issue with your motorcycle, consider having it scanned by a professional tech at a dealership. It is good piece of mind to have a conclusive diagnosis. Then get your motorcycle home, grab your service manual and make the repair yourself.